Bel Canto … an important name indeed. It makes you think of an art, that of “nice singing“ - the English translation for the Italian expression “bel canto” - and that it’s something very hard to achieve. In fact, it’s really hard to have that technical perfection to sing the repertoire of the first half of the 19th Century (Donizetti, Bellini, Rossini just to name the most famous). From the “bel canto technique” comes the ability to use the many tonalities and hues of the voice in order to give the right expression to the singing. Something that is not a common prerogative. The choice of such a name is a bold one. It is sort of imprudent, since it is almost a declaration of intent. I wonder if our quartet will be able to to perform well, close to perfection. We will see it at the end of the review. When the expressivity is contained in the recording and when the system is working as it should, we will have in our room the right sound. The power amplifier is an important component, it is very powerful with rock music but it lets you work with the details too. 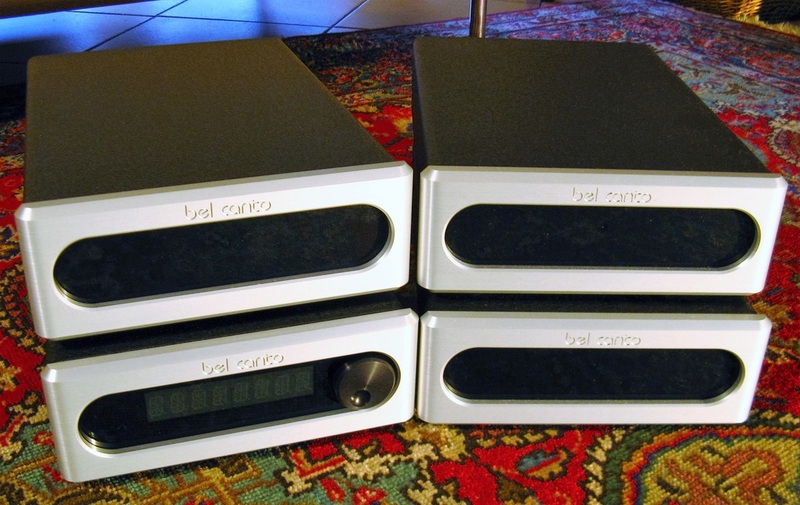 Here we have 300 Watts on 8 Ohms for each power amplifier, that become 600 on 4 Ohms. 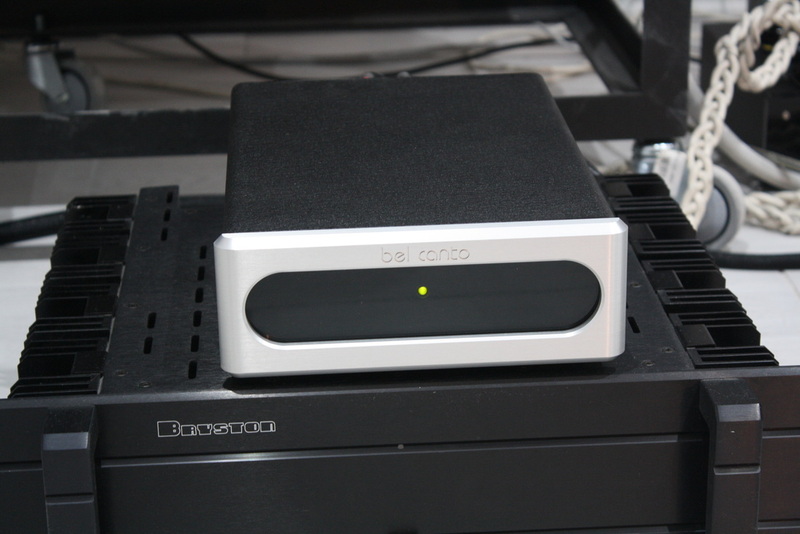 The pre-amplifier works on the small details; it has a separate A/C source and contains a DAC that can manage 24 bit/192 kHz signals. It is flexible enough to satisfy old vinyl lovers (there is an analogue input) but also all those that are attracted by digital. There are all the possible connections, exception made for the USB that needs a separate adapter. I will not explain more about the technology because all technical details are on the manufacturer’s website and are available to everyone with just one click. In the box of the power amplifiers there is the instruction manual and the computer-style power cord. 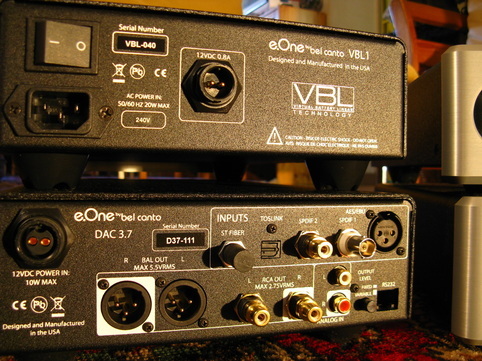 In the preamplifier packaging, we find the remote with the batteries, the connection cable for the separate power unit, and the BNC plug adapter, that allows to connect a common cable with a coaxial 75 Ohm output with a male RCA connector. Well, as for the description it’s all but you can find some pictures attached to this review. Now it’s time to see if these devices sing as their name makes us guess. Bauer DPS 2 turntable with Morch DP6 tonearm and a Lyra Kleos cartridge, American Hybrid Technology -P phono amplifier, Lavardin C62 preamplifier, Bryston 2B-LP power amplifier, Davis Acoustics Monitor One loudspeakers, with the same cables of ever. 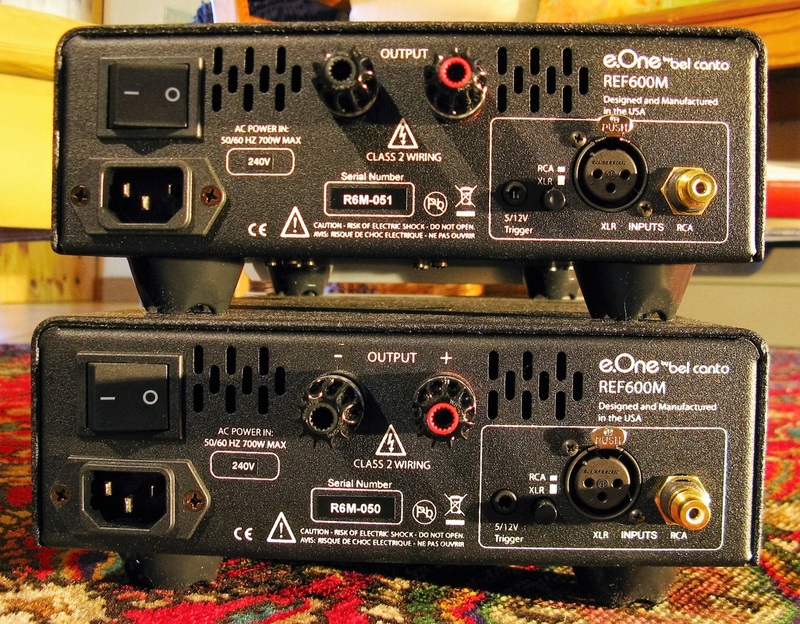 I decided to start by connecting the power amplifiers to my pre amplifier. 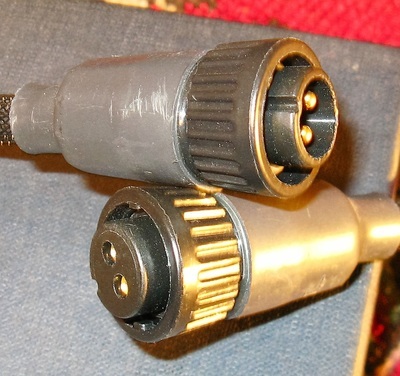 I have used an unbalanced connection and I used their power cables, since I usually make a fine tune once I have understood the sound of the devices that I have to test. As soon as I turned the amps I thought: ”wow! this sound is big!” Indeed, the soundstage is very wide in depth and height and it is well defined. Depth and width depend on the recording, of course, but the feeling of dimension, height and importance of the instruments made straight away a good impression. The power amplifiers are tonally correct. The frequency ranges are all at the same level and maybe only the highest range is a bit recessed but not as it was with other Bel Cantos in the smaller and less recent series. It seems to me that the limit is not in this device but in the recordings that are not made as they should. And I refer not only to recent recording that are compressed or turned into MP3, but also to the classics of the big labels such as DGG, CBS, EMI, that sometimes have poor recordings. When we use high quality recordings, such as Fratres by Arvo Part on Naxos, we hear the soft touch of the violin bow on the strings but also the violent hits of the percussions in a perfectly controlled crescendo.The timbres are correct and the soundstage is enjoyable and I listen to the whole record, also that part in which the strings are very deep, and I refer to “Cantus in Memoriam Benjamin Britten”. When I added the pre amplifier - with the turntable and therefore only with the analogue devices - the sensation of listening to a correct timbre is even bigger. I listen to the old Barbiere di Siviglia conducted by Abbado (DGG) and I have the sensation to be in an old theatre and as I am from Milano, I think about La Scala, with an orchestra that is a bit dark in its pit and the singers clearly present on the stage. If I compare this sound with the usual sound of my system, I find it a bit heavier but very present and with a huge and credible soundstage. When I used the DAC, with the CD player and the coaxial input, the overall sound of the electronic quartett was very natural, there are no dramatizations in the high, medium and low range. Listening to a good recording of a piano, the sensation is that of a real piano in the room. The more you raise the volume, the more it seems that the instrument is close to us. This is a good result for an instrument that many people deem to be hard to reproduce. With some recordings that are not easy, recordings of old time music such as Fair, Sweet and Cruel on BIS, Puer Natus Est by Stile Antico on Harmonia Mundi, Missa Bell’Amphitrit Altera by Orlando di Lasso on Argo or again the Segentiae by Hildegarde von Bingen on Harmonia Mundi, the sound is really pleasant. It is very natural, without roughness but rich in voices’ small details. 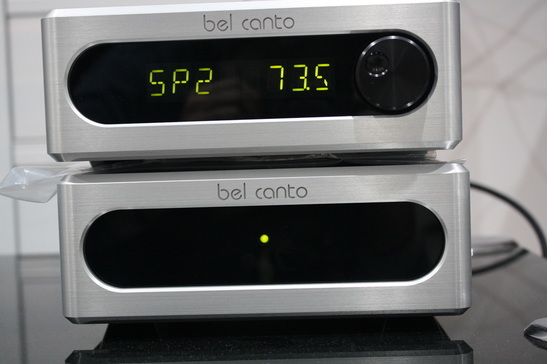 The two power amps are powerful and with the help of the DAC/preamplifier there is no sign of effort, the music flows easily. In the Fanfare for the Common Man by Copland on Crystal Clear the percussions with their ample dynamic variations are reproduced with great power, tamed and very credible. The sound is so natural that you forget about the presence of the electronics and believe me, for me this is a compliment. In the Départ by Wolfgang Rihm (Wien Modern, Abbado, DGG) there are many violent dynamic contrasts and the intensity of the lower sounds are not covered by the powerful ones. The so called selectivity is well present here and very well integrated with the rest. This is a very good amplification for all those that want high quality and operativity but do not want to engage the room with big and heavy devices. 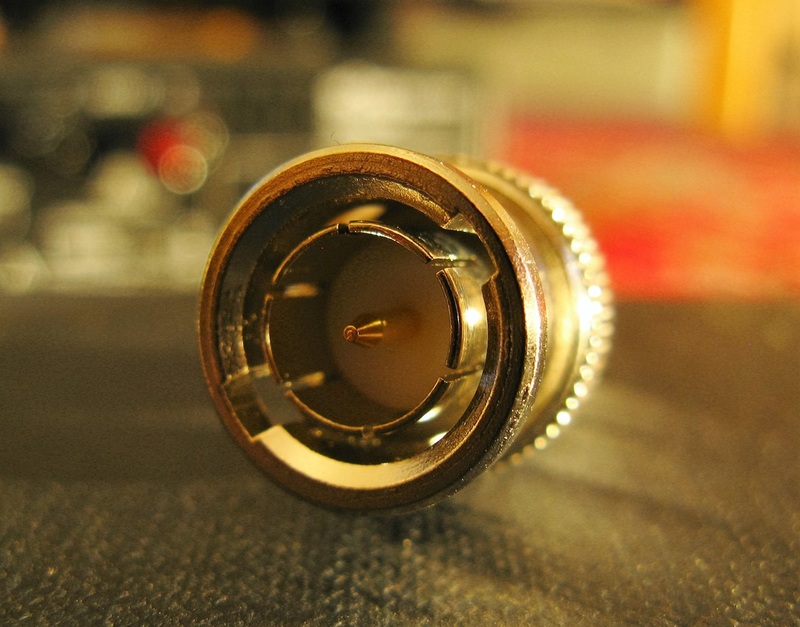 Below you will find the usual advice that is valid for all the PWM modules amplifications. One final note. The power amplifiers, (preamplifiers do not do it), that use PWM technology usually have an annoying effect on the sound. It is a noise that contaminates the main sound; it is hard to explain what it is but if you listen carefully you spot it. It is usually more evident with the piano sound and the right portion of the keyboard. Since these power amplifiers use this technology, they have this flaw. It is something that belongs to this kind of technology but in this case it is reduced to the minimum and it is not so evident or annoying as it was with other devices and it is evident only at a very high volume. 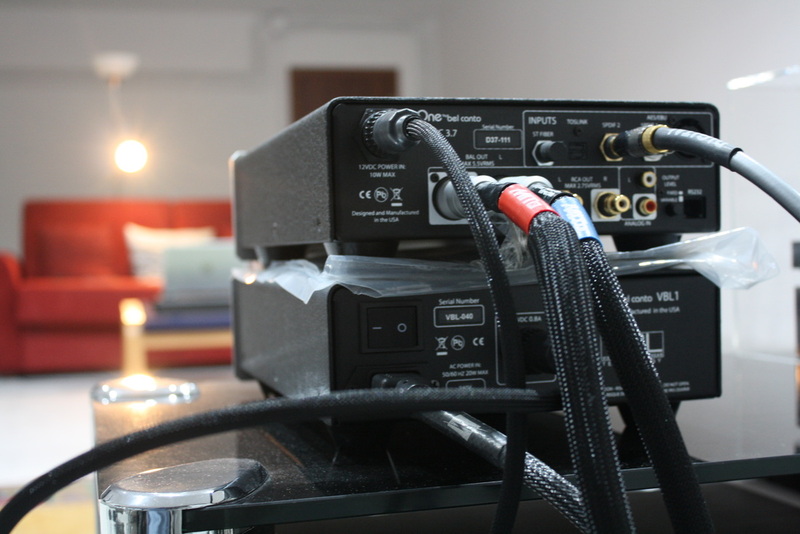 Power amplifiers with digital technology usually do not support complex loads; with the JBL 4350 and the top series MIT cables of Angelo Jasparro’s system the power amplifiers had a bad and compressed sound. This is something that did not happen when connected to my system that has different cables and loudspeakers with another kind of crossover. In my system I have not heard any compression at all. After all the “bel canto” was respected and so ... viva Rossini! I want to add something to what Domenico Pizzamiglio wrote, especially about the bad sound that the Bel Canto produced with my system. I have changed my listening room, while he was reviewing these products. The new room is bigger and cozy, it has a different location and has a dedicated power system, but I will deal with all the details in another article. As for the bad performance of the Bel Canto, I must say that this thought was somehow haunting me. I wanted to understand the reasons for that sound so different from the sound Domenico achieved. As soon as Domenico finished with his review, he brought them back to my place, since I had to send them back to the Italian distributor. Accidentally my new room was ready and I had already tested its sound, so I decided to give these Bel Canto another chance. 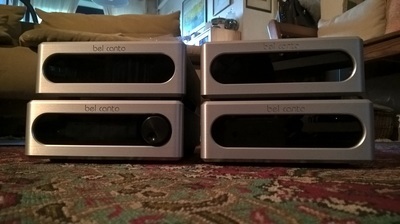 I connected the three devices: preamplifier and power amplifiers … well well, the sound is different and it is not bad at all! I do not know the reasons for this change but for sure it is not a problem connected with the MIT cables or due to some other part of my system, as we thought before. The performances in my room are very similar to those described by Domenico and I will not go into details. In this moment I am listening to Pogorelich in the CD “Mozart-Piano Sonatas” (DG) and I do not hear any distortion or compression. I recognize the small defect due to PWM technology that Domenico described but I must say that it is really almost indiscernible in a blind test. The sound is correct and the frequency response is straight, there are no negative comments I can make on the overall result. 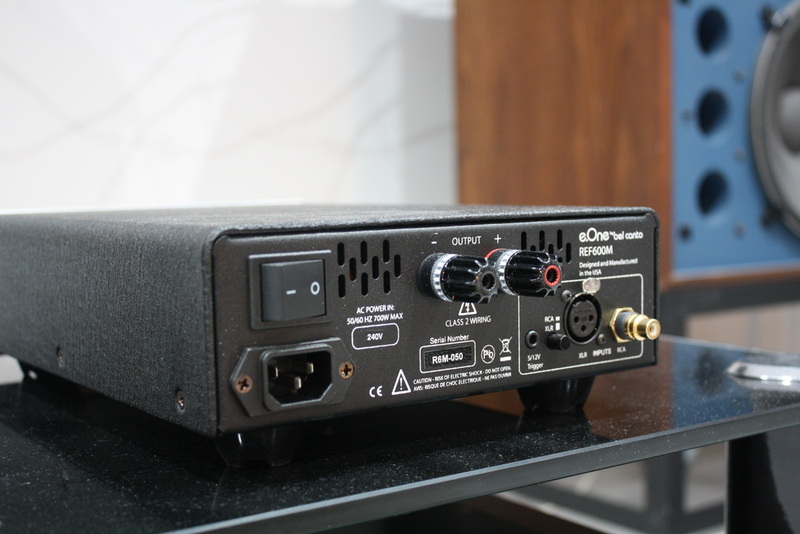 I want to describe better the characteristics of the DAC 3.7 preamplifier. The volume control has a remote, it is a 24 bit digital control and all the 5 digital inputs are asynchronous. There is no USB input. Bel Canto gave the priority in this top of the range device to the preamplification section. All the Bel Cantos smaller models have a USB input. I think that the choice to use a specific interface is linked to technical reasons. 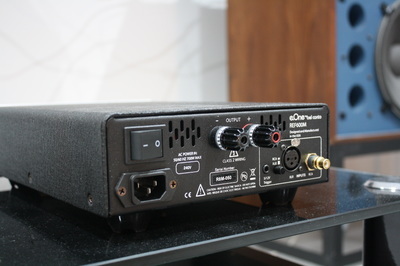 The Playback Designs MPS-5 digital DAC/player has the same characteristic. As for the power amplifiers, the technology of the Class D modules that they use is something new. They shifted from ICE-Power by B&O to nCore modules produced by Hypex. In conclusion, this is a quartet with a simple and elegant look, with an impeccable and accurate sound given at reasonable price, perfectly in line with today’s market. If you do not have much space and you want devices that do not need a lot of electricity, these are the perfect buy. 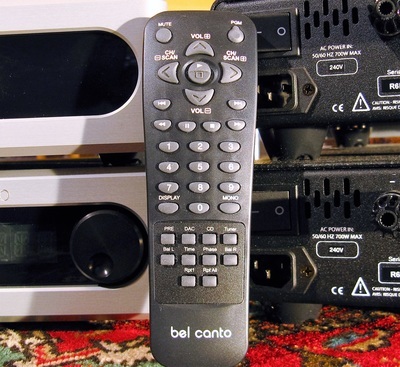 Bel Canto suggests to keep them on all the time, the electricity they need is really paltry, and their sound is really better when they are at the right temperature.